At the Stockroom we can wait to see what Our Legacy bring out each season. We cant get enough of there simple yet unique style. As bold prints are big in this spring summer season they have gone with it in there own unique way. 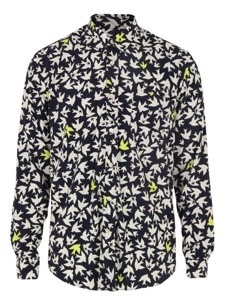 Instead of going with the very popular leopard or camo print, Our Legacy have come up with swallow print. The long sleeved shirt comes in sky blue with woven white and yellow swallow pint all over. You get all of the finer details to the shirt as you would expect from Our Legacy a slim collar, single chest pocket and single button cuffs. We think this is a must have for this season and we will certainly be wearing this shirt in the up and coming seasons. You can get yourself this shirt from Coggles.